The 2018 Subaru Crosstrek can take you anywhere you need to go, so it’s no wonder the tagline is "There’s always room for more stories." Along with an attractive interior, this vehicle has a high ground clearance and plenty of features for a long drive. We’re comparing the trims to help you decide which one is right for your next adventure whether it’s on the paved road or off the beaten path. 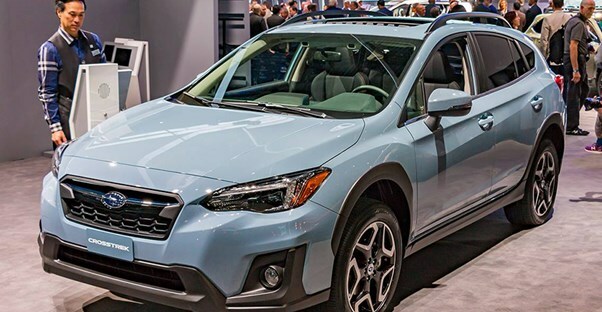 The Subaru Crosstrek 2.0i focuses on affordability, so it isn’t a surprise that this trim is just $21,495. It’s equipped with a 2.0-liter DOHC engine that’s capable of 152-horsepower and 145 lb-ft of torque. This allows drivers to tow a maximum of 1,500 pounds, ideal for small trailers. With this engine, the 2.0i Crosstrek gets up to 23 mpg in the city and 29 mpg on the highway. All trims feature Symmetrical All-Wheel Drive, so drivers have maximum control. The Crosstrek lets you go where your heart wants, including off-road. For this reason, the 2.0i comes with 8.7-inches of ground clearance and raised roof rails for extra storage. This trim also comes with STARLINK Multimedia with Apple CarPlay and Android Auto integration. The 2.0i Premium starts at $22,595 and is an upgrade from the 2.0i. On the exterior, safety improves with the addition of fog lights. It also comes with a windshield wiper de-icer and heated side mirrors as part of the All-Weather Package. The All-Weather Package also adds heated seating on the interior. Drivers can also find a leather-wrapped steering wheel with orange stitching, sun visors with illuminated vanity mirrors, rear cargo tray, and retractable and removable cargo-area cover. Finally, the 2.0i Premium also adds two more speakers than the 2.0i, bringing the 2.0i Premium's total to six speakers. The most significant upgrade is the SUBARU STARLINK Safety and Security. This provides a few features that help protect drivers and passengers including Automatic Collision Notification, SOS Emergency Assistance, Enhanced Roadside Assistance, Stolen Vehicle recovery, diagnostic, security, and remote services functions. The Subaru Crosstrek 2.0i Limited starts at $26,295. This trim has several more luxury features that may make you think you’re driving a luxury brand. The first notable feature is leather-trimmed seating. To add to this, the driver’s seat allows power adjustment, and the shifter handle and automatic transmission handle are also wrapped in leather with orange stitching. For convenience, the 2.0i Limited has automatic climate control, so you don’t have to take time to fiddle with the AC or heat. The STARLINK system receives an upgrade to an eight-inch multimedia full-color screen. With this system, you can access SiriusXM All Access Radio, Traffic, and Travel Link. You can also use Yelp and iHeart Radio thanks to STARLINK’s cloud-based applications. If safety is important to you, the 2.0i Limited is your best bet. Along with the upgrades in the 2.0i Premium, this trim also comes with Blind-Spot Detection and Rear Cross-Traffic Alerts. You also add EyeSight Driver Assist Technology, High Beam Assist, and Reverse Automatic Breaking at an additional cost. Which 2018 Audi A6 Is Right for You?